Every bride waits for that breathtaking moment of being able to walk down the isle. Her groom stands at the very end, waiting patiently awaiting for her arrival. However, before the big day approaches, here are some tips and suggestions from the Westwood to make the day even more prefect and stress free! Always make sure that the bridal make up will last throughout the entire day. The Wedding day is filled with emotions and the tears of happiness come very easily. This is why using waterproof mascara can come in handy! Don’t you think that brides would love to have a radiant smile in every photo? Some brides in the past have used some tricks in order to maintain a beautiful smile. A few days before the Wedding, the bride should use crest whitening strips or brush their teeth with baking powder and lemon! The worst thing that can happen to a bride is that her hair may not come out the way she wants it to just a few hours before the Wedding. This is why it is always smart to get the hair done a few times a day or two before the Wedding, Giving the bride many options on which best suits her and feels the most beautiful in, this would allow her to decide on which hair style works out the best for her. Last but not least, a bride should have cute but comfortable shoes. If she plans on dancing the entire night away, she needs to make sure that shoes are not going to bruise her feet! The best shoes that can be worn are flat ballet slippers, or very small heels from about a half an inch to 2 inches. By doing just a few of these suggested things, the bride can prepare herself for a very enjoyable day and or night. 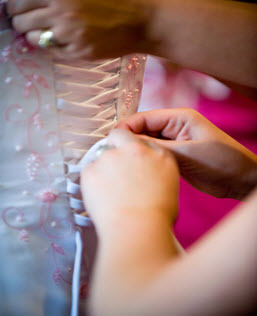 Every bride deserves to feel comfortable and stress free on her Wedding Day!